New Balance Hanzo are neutral racing running shoes. The New Balance Hanzo is the new racing flat from the american brand, exciting news for all those disappointed with 1600 v2 not being available any more although not an appointed replacement. The Hanzo can be placed just one step below fast 1400 v4 and it takes its name from legendary japanese samurai, ready to support lead group in every road race. Upper is divided into 2: open and breathable synthetic mesh with sewed overlays in the forefoot and combination of materials named FantomFuse™ which provides consistency with secure wrap for snug fit along the rest of the shoe. The narrow fit (NB-J) has been specially designed for highest performance when racing. 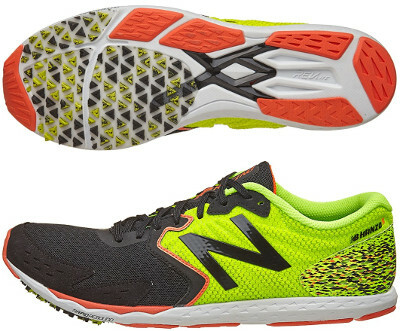 As well as other racing shoes from New Balance like 1500 v3, midsole is based on reliable REVlite® and adds Rapid Rebound foam in the forefoot for bouncier response and quicker transition. Sticky Dynaride outsole with triangular lugs features excellent traction while different size units of harder rubber are placed in more exposed areas for longer durability.